Construction of the Metropolitan District Railway, Bayswater, London, c 1867. 'Arabesque Arch', Liverpool & Manchester Railway, mid 19th century. 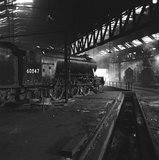 LNER A2 4-6-2 no 525. London, Midland & Scottish Railway Directors and officers, February 1931. Suspended locomotive, North Eastern Railway's Gateshead Works, c 1910. Opening of the Canterbury & Whitstable Railway, Kent, 3 May 1830.